WHERE ARE THE 12 PACKS OF DIET POMEGRANATE 7-UP????? You've been teasing me for weeks with that empty spot on the shelf with a label on there, all ready for the product to go there. And as much as I'm in Target, I was sure I'd see it. But no..... I swear, you haven't put any out yet. 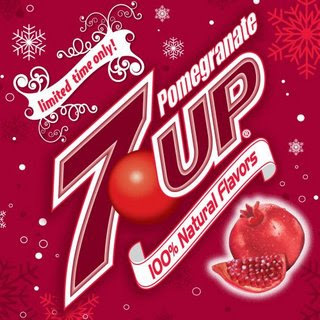 I love the Pommegranate 7-Up. I found the pop at a Jewel grocery store in the Chicagoland area. I also saw the 2 liter pop at Walgreens. I have yet to see the diet version. Oh, yes, yes, YES! Love that stuff! Hope you find it soon!